This book contains numerous win rates. Their purpose is to aid in understanding the importance of various rules options. This book assumes that decisions are made on the basis of expected value, also called expected win. Whether an action turns out to have been correct or incorrect on one isolated hand does not matter. What does matter is what the average outcome would be over thousands and thousands of such decisions. A positive expected win rate means that you are expected to win in the long run, and a negative expected win rate means that you will lose in the long run. For example, when your expected win rate is -0.5%, you are expected to lose at the rate of 0.5%. Here is a question from a reader. I like it because the answer to it is a good example of what this book is all about. Why should I not split 10-10 when the dealer shows 5? I like the idea of starting two new hands with a single good card. I am likely to draw totals much better than the dealer will get when he starts with the worst of cards. This reader is correct in that starting with a 10 is likely to lead to a good hand. You will make money if you split 10-10 against the dealer’s 2, 3, 4, 5, 6, 7, 8, or 9. You will make money splitting 10-10 against 10 or ace if you lose only one bet to a natural. You will also make money if you do not split 10-10. You should split or not split depending on which alternative makes more money. With 10-10 against 5 you make about 25% per hand by splitting but you can make 67% by not splitting. Making 67% is more attractive than twice making 25%. Therefore, basic strategy says do not split 10-10 against 5. I have selected a benchmark, an arbitrary set of rules, playing conditions, and bets. Use of a different benchmark would result in different numbers. However, the relative importance of different rules variations would be approximately the same no matter what set of rules was used as the benchmark. The benchmark betting scheme is not the best way to bet. Much better is to leave the table on negative counts. On positive counts, you must bet in a manner that does not attract unwanted attention to yourself. 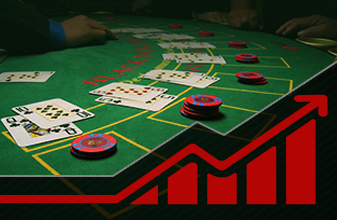 Simulating the base set of rules and betting scheme finds a win rate that is a benchmark for evaluating the cost or benefit of various deviations from the benchmark rules. One-deck cut, meaning five decks are dealt out. Dealer stands on soft seventeen. Double down is allowed on any first two cards but not after splitting. Resplits are allowed to a total of four hands. Split aces receive one card each, and cannot be resplit. Insurance is offered, but no other side bets. No surrender. Naturals pay 3:2, and tie a natural by the dealer. The high-low counting system is used, with strategy numbers from -10 to +10. There is a total of two players at the table. The bet scheme is $100 at counts per deck of +4 or more, $75 at +3, $50 at +2, $25 at zero or +1, and $10 at all negative counts. win rate $16, standard deviation $415. 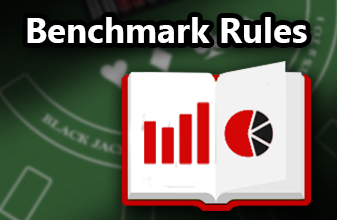 Benchmark Win Rate As noted above, the benchmark win rate is $16 per 100 hands, with a standard deviation of $415. In a casino you will be able to play 50 to 300 hands per hour, so 100 hands represents roughly an hour’s play. Throughout this book results are stated in dollars per hour, which really means dollars per 100 hands. Sampling Error That $16 win rate is a simulation result, and thus is an estimate. Though it is an estimate for 600 million hands of blackjack, it still contains what statisticians call “sampling error.” That is, a different 600-million-hand simulation would result in almost but not quite the same number. The term used to describe the precision of an estimate is the standard error. The standard error applicable to the $16 win rate is $0.20. The actual simulation result was $15.78, which was rounded because the pennies and dimes are not significant. So you should think of the $16 as meaning somewhere in the $15.38 to $16.18 range. It would be nice to have a smaller standard error of course, and the way to do that is to increase the sample size. That is the reason why the sample size was run up to 600 million hands — to reduce the standard error to a reasonable number. Each of the win rates in this book has a standard error of less than $1. So if one rule is changed from the benchmark, and a simulation with the new rule yields a win rate of say $20 per hour, that rule increased the win rate by $4 per hour. That $4 can be thought of as the value per 100 hands to a card counter of that rule change. But it is not exactly $4 per 100 hands because both the $20 and the $16 are sample statistics with sampling error. If you run your own simulation trying to duplicate these results you probably would get $4, but you could possibly get $3 or $5 as the value of the rule. And of course if you use a different bet scheme, a different counting system, make an occasional error, or play against a different number of decks or with a different number of players at the table, or with different penetration, the value to you might be different from $4 per hour. The average bet size for the benchmark is $26.54. 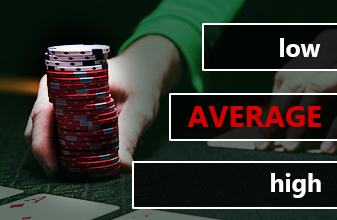 That is the average initial bet; it does not include additional amounts wagered on doubles, splits, and side bets such as insurance. That $26.54, plus or minus a penny or two, is the average bet size on all simulations reported in this book for six decks, penetration down to the last deck, and the high-low system. The standard deviation for 100 hands for the benchmark is $415. That is, the win rate may be $16 but any given 100 hands typically has a result considerably less than or more than $16. In repeated samples of 100 hands, 2/3 of the samples have wins of $16 plus or minus $415. Risk varies with the rules. Some rule changes mean more risk, and some mean less risk. Being able to double down more often (such as after splitting pairs) means more risk, as represented by a higher standard deviation. Restrictions on doubling down mean a lower win rate but that is partially offset by lower risk. Win Rates Reported Each simulation win rate in this book is reported in the form of win rate per 100 hands using the benchmark betting scheme, and the standard deviation applicable to 100 hands. The rest of the information pertaining to that simulation is the same as the benchmark as discussed above. As an example, if one deck with penetration 26 cards is used instead of six decks, but everything else kept the same as the benchmark, the win rate is $48 and a standard deviation of $482. That means the simulation win rate averaged $48 per 100 hands, and the standard deviation describing the ups and downs in 100 hands was $482.